Dhaka, 9 July, Abnews: The cabinet has given approval to the draft of the Jatiya Krishi Niti-2018 with an objective of making the agriculture sector safe and profitable for farmers and attaining food and nutrition security for the people. 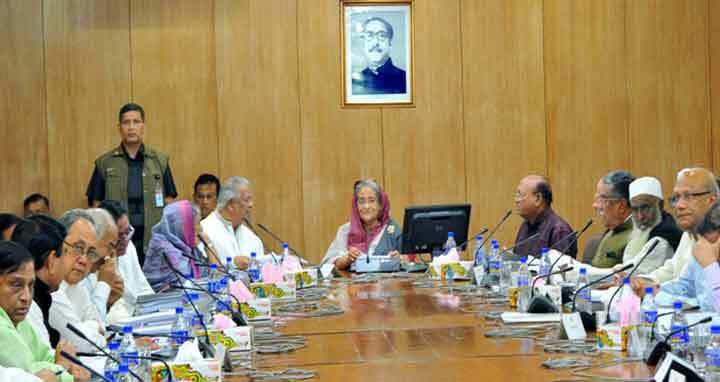 The approval was given in the weekly meeting of the cabinet held at Bangladesh Secretariat with Prime Minister Sheikh Hasina in the chair. Briefing reporters after the meeting, Cabinet Secretary Md. Shafiul Alam said the new policy has been framed by upgrading the previous policy of 2013, setting up the prime goal of making the agriculture sector safe and profitable, and attaining food and nutrition security in the country. The cabinet also has given approval in principle to the draft of the Bangladesh Shishu Academy Act, Alam said. The cabinet secretary said Jatiya Krishi Niti-2018 is an overarching and detailed one which included the issues not addressed in the previous policy. The purpose of the policy is to increase the productivity of the crops, enhance income of the farmers, diversify of crops, produce nutritious and safe food, develop marketing system and ensure food safety through efficient use of profitable agriculture and natural resources and socioeconomic development, he said. Alam said the issues of nanotechnology, standard seed production and urban agricultural services, agro-machinery services, innovative extension technology, setting up of agriculture technology block, year-round production were included in the policy. The Supreme Court in a verdict in 2010 annulled all laws framed by the military rulers asking the government to replace those with new ones in Bangla. Accordingly the Shishu Academy Ordinance became defunct and the new law will replace it. As per new draft, a Director General (DG) will remain as the chief executive of the academy. The academy will have its head office in Dhaka, and with permission of the government, the academy can open its branches at divisions, districts and upazilas. A 17-member Management Board headed by a chairman would operate the activities of the academy. Shishu Kalyan Parishad, and four distinguished persons who has contribution to welfare of children. Out of four distinguished persons two must be women. The academy will give honorary fellowship to distinguished persons having outstanding contribution to language, literature, science, arts or any special social areas and working for overall welfare and development of the children.